CTV News at Noon - Why One Exercise Doesn’t Fit All! I'm going to start this off by saying everyone is different. Which is why your best-friends workout may not work for you. You may think you hate working out but you just haven't found the RIGHT workout for YOU. On CTV News at Noon we chatted about the 4 main personality types and what workouts they see the best results with. Watch the full segment HERE! The Planner: Takes a more reserved approach to fitness, sticking to familiar, tried-and-true exercises. Personal Trainer - benefits of working one-on-one for accountability, technique assurance, guaranteed results. Using the MandyGill APP is ideal for the planner because you know what workout is coming, how much time you have to complete it and a sense of accomplishment afterwards. The Go-Getter: Loves competition and intensity and thrives off of seeing continued improvement. -Snowshoeing, this complete lower-body workout, focuses on the quads, hip flexors, and glutes. A 150lb person will burn approx 650-700 calories/hr. -Hiking, a fabulous opportunity to visit our local mountains and get fresh air! -Weightlifting, increases metabolism, improves sleep, toned appearance (building muscle can help you lose fat). The Social Butterfly: Unsurprisingly, loves group fitness and positive energy. The Adventurer: Will try anything and everything, even if it's just a passing fad. -Trampoline Fitness, bounce your way to health with improved cardio, joint support, Aerial Yoga with a focus to decompress the spine, stretch your muscles, and build strength, all while relaxing in a hammock. -Aerial Yoga, with a focus to decompress the spine, stretch your muscles, and build strength, all while relaxing in a hammock. 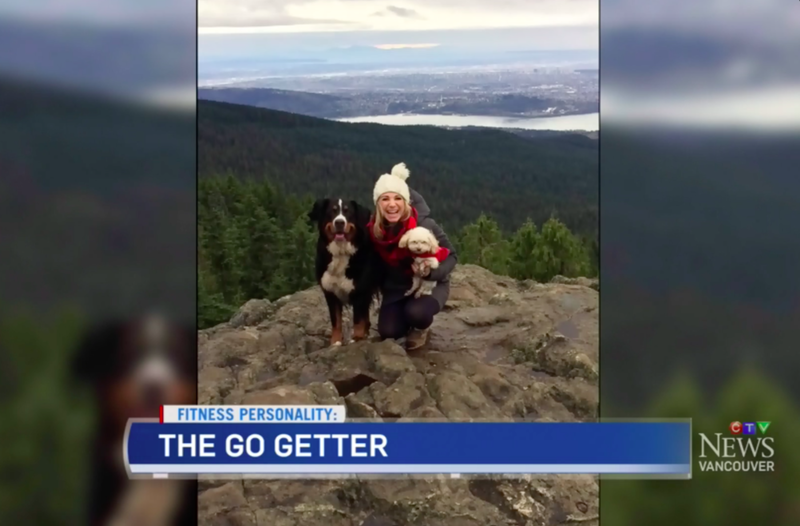 -Exercising With Pets, Vancouver held their first Goat Yoga class a few months ago, and there's more to come! Veganuary - Where are you getting your protein from?